To commemorate 25 years of service, each month this year the Armenian EyeCare Project will feature a key element of our organization that has allowed us to bring eye care to the people of Armenia. Last month, we shared our comprehensive, five-point strategy for delivering eye care to hundreds and thousands in Armenia. This month, we write about our Low Vision Clinic — the only clinic of its kind in the Caucasus. 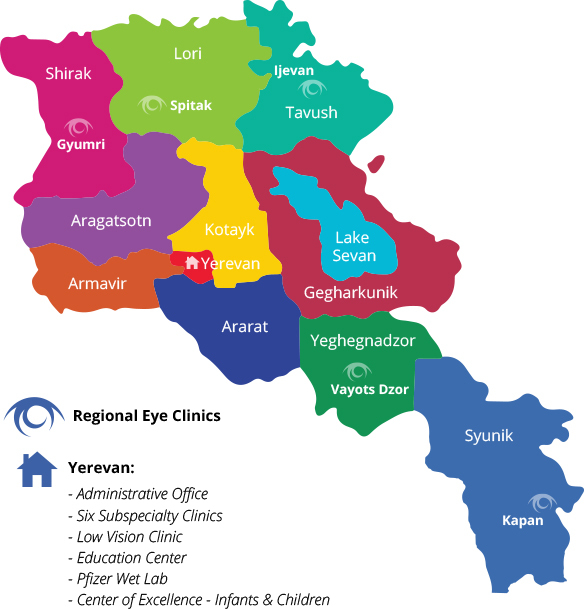 The Armenian EyeCare Project opened its Low Vision Clinic in Yerevan, Armenia in 2005. The only center in the Caucasus region completely dedicated to those with low vision, our Clinic has opened a new world for the visually impaired and given those with the disability a place to go to become independent and productive members of society. Low vision is a loss of sight that cannot be corrected with eyeglasses, contact lenses, medication or surgery. It is the result of a variety of diseases, disorders and injuries that affect the eye, including age-related macular degeneration, cataract, glaucoma and diabetic retinopathy and affects 246 million people in the world. Low vision can make everyday tasks extraordinarily difficult. Activities like reading, writing, driving a car, or even recognizing faces may be hard to accomplish, if not impossible. Still, the loss of vision does not mean those with the condition have to give up leading a normal life. People with low vision still have some useful sight so it’s about learning how to make the most of their remaining vision and finding new ways to perform daily activities to maintain the highest possible level of independence. That’s where our Low Vision Clinic comes in. We work with patients who have uncorrectable visual impairments and teach them the vocational and life skills they need to be fully functioning members of society. Directed by Dr. Lilit Mkrtchyan, the Low Vision Clinic treats approximately 7,000 patients a year and is located at the Kanaker Zeitun Medical Center in Yerevan. Dr. Mkrtchyan established the subspecialty clinic following completion of her AECP-sponsored fellowship in Florida at the Tampa Lighthouse for the Blind, a non-profit organization that provides rehabilitation programs for people who are blind or visually impaired. During her fellowship, Dr. Mkrtchyan was very impressed with the Lighthouse, an organization dedicated to helping those with visual impairments make the most of their disability — something that was not even considered in a developing country like Armenia. The Low Vision Computer Training Program, our first initiative for low vision students, provides the visually impaired with basic computer skills that enhance their professional and personal lives. Taught by a qualified low vision professional, the two-month training sessions cover a range of subjects from computer programming and data entry to how to use the Internet and download books in Braille. “For people with visual impairments, the possibility of using a computer is a big step forward in obtaining access to information, learning new skills and gaining computer literacy,” says Dr. Mkrtchyan. 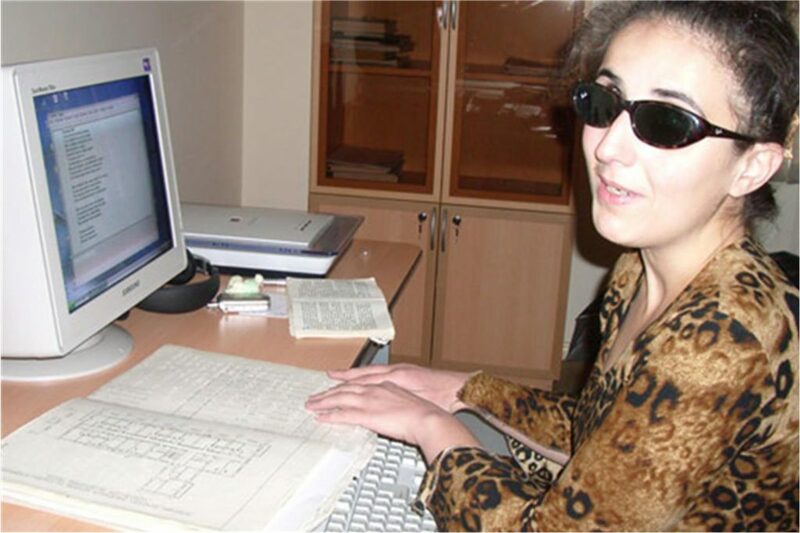 Naira Karapetyan is one young woman whose life has become much more meaningful since participating in the Low Vision Clinic’s Computer Training Program at the age of 21. Losing her vision at a very young age, Naira doesn’t remember ever seeing objects, faces or colors. Now she imagines the world in a brighter light. “I have never used a computer before this training and I am now confident I can use the knowledge and skills I have learned independently,” she said with excitement. “There is so much ahead of me! Participants like Naira gain confidence and self-esteem from their newfound knowledge and can spend their time in a meaningful and useful way, reading books transcribed in Braille and gaining access to more resources. The training also offers those with low vision the unique opportunity to develop their professional skills and equips them with the tools necessary to find employment. In fact, in developed countries, computer technology has removed many obstacles in education and employment for the visually impaired. Through specialized courses like those we provide at the Low Vision Clinic, students use their computer skills to get jobs as typists, office workers and even programmers. Adults with visual impairments can work and pursue a range of careers in mainstream society using computers and other devices and students can complete homework, do research, take tests and read books like their sighted classmates. In addition to the Computer Training Program for adults, our Low Vision Clinic also offers training classes for children with visual impairments. The goal of these classes, given to students from the Yerevan Special School N14 for Children with Visual Impairments, is to help children with low vision preserve their remaining sight and orient themselves with unfamiliar situations with the assistance of available resources like a walking stick and specialized motion detection glasses. The mission of these training programs and our Low Vision Clinic is simple: to provide adults and children with the low vision tools they need to thrive despite living with a disability. If you would like to support our Low Vision Clinic in Armenia, the only clinic that offers specialized training for visually impaired people in the Caucasus and surrounding regions, you can sponsor a specialized computer class for the visually impaired or purchase much-needed low vision devices that will be sent to the clinic in Yerevan.